Funded in-part by a grant from the California Air Resources Board through California Climate Investments, the project will provide the largest ever US deployment of zero-emission school buses to reduce greenhouse gas emissions, eliminate mobile criteria pollutants, and provide sustainable transportation for school children in California’s capitol. STOCKTON, Calif.--(BUSINESS WIRE)--First Priority GreenFleet, a national leader in clean transportation solutions, is partnering with the Sacramento Metropolitan Air Quality Management District (SMAQMD) to deploy 29 electric school buses and charging infrastructure throughout Sacramento County, including Twin Rivers, Elk Grove and Sacramento City Unified School Districts. Funded in-part by a grant from the California Air Resources Board through California Climate Investments, the project will provide the largest ever US deployment of zero-emission school buses to reduce greenhouse gas emissions, eliminate mobile criteria pollutants, and provide sustainable transportation for school children in California’s capitol. School buses are the largest segment of mass transit in the United States, carrying twice as many passengers as the entire US transit bus and rail segments combined. Existing diesel school bus fleets disproportionately expose school children to toxic air contaminants and associated health risks. This large-scale deployment will eliminate mobile criteria pollutants and provide health co-benefits to both school children and the greater community. 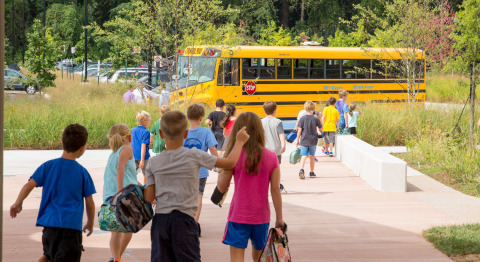 First Priority GreenFleet, a division of First Priority Global, Ltd, is excited to serve school districts with high quality, zero-emission school buses, focusing on eliminating toxic exposures and improving safety for students. In partnership with CARB and SMAQMD, First Priority GreenFleet will deploy the 100% battery-electric, zero-emission eLion Type C school buses and the Trans Tech all-electric eSeries , built on the Ford E450 chassis with an all-electric power train developed by Motiv Power Systems, as well as oversee the implementation of the charging infrastructure with EV Connect and the deployment of the Data Management System to optimize charging. The Project will demonstrate the considerable advancements in electrification of school bus fleets and charging optimization, including Vehicle to Grid Integration (VGI), while significantly reducing toxic diesel exposures to school children on the buses. 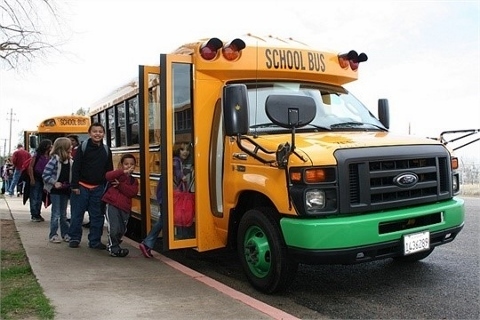 The goals of the project are to demonstrate that commercially available zero-emission school buses have the lowest cost of ownership, substantially reduce maintenance costs, improve operational performance, and are optimally suited to serve the needs of school districts and sustainably transport California’s kids to and from school. The Sacramento zero-emission school bus deployment is part of California Climate Investments, a statewide program that puts billions of cap-and-trade dollars to work reducing greenhouse gas emissions, strengthening the economy and improving public health and the environment—particularly in disadvantaged communities. 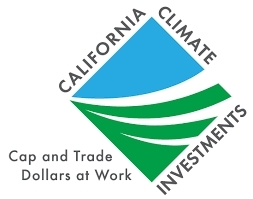 The cap-and-trade program also creates a financial incentive for industries to invest in clean technologies and develop innovative ways to reduce pollution. California Climate Investments projects include affordable housing, renewable energy, public transportation, zero-emission vehicles, environmental restoration, more sustainable agriculture, recycling and much more. At least 35 percent of these investments are made in disadvantaged and low-income communities. For more information, visit California Climate Investments. Jill Gayaldo, Director of Transportation Services, Elk Grove Unified School District: “The Elk Grove Unified School District has always been a leader in alternative fuels. We are very pleased to participate in this partnership to provide clean-running, safe buses to our students and our community. We embrace the opportunity to lead the way into zero-emission technologies.